The Fuelman Diesel Platinum Fleet Card is the choice for businesses of all sizes with diesel fleets that want controls and retail-based savings on diesel fuel. Customers can earn 8¢ per gallon cash back on diesel fuel throughout the Fuelman Network at over 50,000 gas and maintenance locations nationwide. 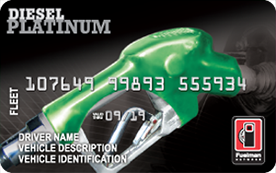 Savings go beyond discounts with the Fuelman Diesel Platinum Fleet Card. Diesel fleet managers waste money every year due to unauthorized driver purchases. Set controls to ensure driver only makes approved business purchases and customize card spending limits all while monitoring driver activity in real-time. Check on your drivers from anywhere with the Fuelman Diesel Platinum Fleet Card. This card comes with access to a robust fleet management system that includes real-time reporting, online account management and an online fuel and maintenance locator to improve efficiencies of your fleet’s route planning and logistics. *Earn a 8¢ per gallon volume rebate on diesel purchases for the first twelve months following account setup. Rebates are subject to forfeiture if account is not in good standing. Program pricing reevaluated annually and subject to change thereafter. Rebate is not available on purchases at The Convenience Network brands including Loves, Chevron/Texaco, Arco, Sinclair and Walmart. Transactions at Arco are subject to special pricing. Program Terms and Conditions apply. Visit www.fuelman.com/terms/ for details. Fees may apply in some cases, such as for optional services, late payments and/or credit risk.Fuelman® is a registered trademark of FLEETCOR Technologies Operating Company, LLC.